Prime minister Malcolm Turnbull may face a comeback bid from the rival he ousted last September, Tony Abbott (AAPIMAGE / Alan Porritt). Five days after its July 2 election, Australians woke up Thursday morning to find that they still don’t know who will lead the next government — and that Standard and Poor’s is moving its ‘AAA’ credit outlook from stable to negative as political uncertainty reigns. 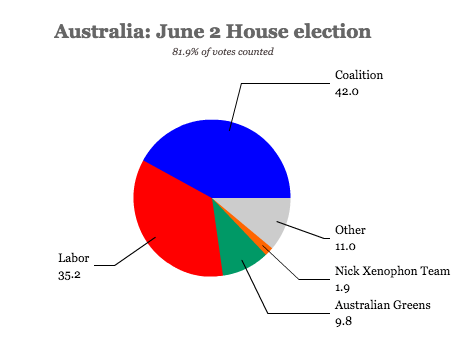 The only clear result of the first ‘double dissolution’ election since 1987 is that it might be days or weeks before Australians know who will hold a majority in either house of their parliament, with every possibility that both houses could wind up with no clear majority. 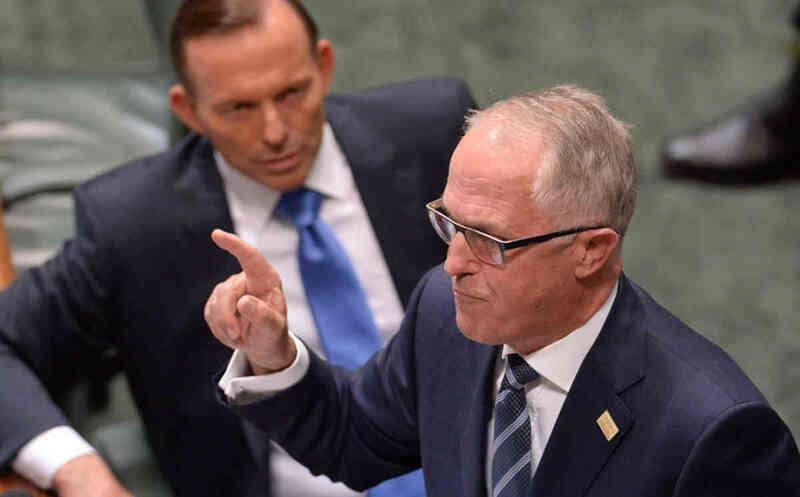 The other clear result is that the election is that, though his Liberal/National Coalition is growing closer to winning the narrowest of majorities, prime minister Malcolm Turnbull is the clear loser of the election. Just nine months into his premiership after he convinced his party to oust its prior (more conservative) leader Tony Abbott, Turnbull has lost at least 16 seats in the 150-member House of Representatives to the center-left Australian Labor Party (ALP). 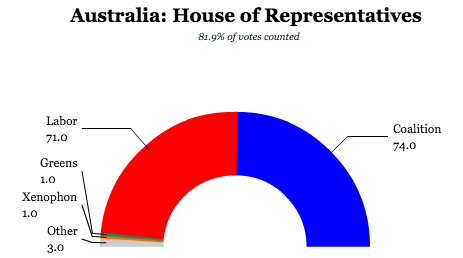 The Coalition, as things currently stand, is now trailing in the so-called two-party preferred vote (under Australia’s single transferable vote system) by the narrowest of margins — 50.09% for Labor to 49.91% for the Coalition. For someone whose leadership pitch came down to electability, it means his days as prime minister might be numbered — even if the Coalition emerges with a majority. Politics isn’t always fair, but Turnbull’s problem has always been that he’s a moderate in a conservative party. I have no doubt that Turnbull, who has always been far more socially progressive than many other Coalition MPs, would like to accomplish some heady goals as prime minister. He’s been an ambitious man his whole life, and there’s no reason to believe that, with the right kind of mandate, Turnbull would like to solve several conundrums that neither the Coalition nor the Australian Labor Party (ALP) have been able to solve. He might *like* to find a way to end the detention centers in Nauru and Manus Island without encouraging thousands of poor Asians to risk their live by getting on rafts to Australia, especially after Papua New Guinea’s supreme court ruled the Manus Island detention center unconstitutional. He might *like* to have Australia’s parliament vote to pass marriage equality for gay and lesbian Australians and be done with an issue that now separates Australia from much of the rest of the developed world — almost all of western Europe, Canada, New Zealand and the United States. He might *like* to redesign the failed carbon trading scheme that former Labor prime minister Julia Gillard enacted (and that Abbott, a few years later, abolished) as perhaps a business-friendlier carbon tax. After all, Turnbull lost his position as leader of the Liberal Party to Abbott in 2009 after he tried to compromise with the Labor government on climate change. He might even *like* to take another run at an Australian republic after leading the pro-republic campaign in the failed 1993 referendum.